Fliers left on doorsteps in some neighborhoods have come to the attention of the Missoula Police Department, though no official reports had been taken by Wednesday afternoon. 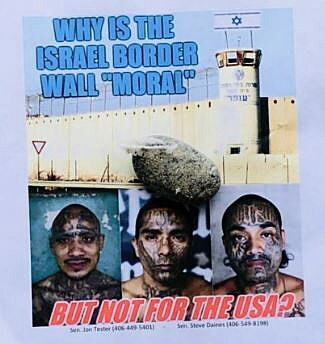 The fliers picture three heavily tattooed men of apparent Hispanic descent below an image of a fortified wall and the words “Why is the Israel border wall ‘moral’.” In small font below the image, the flier includes the numbers of Sens. Jon Tester and Steve Daines. Welsh said that while the flier depicts three non-Caucasian men, it doesn’t appear to target minorities in an overtly threatening way. Rather, it attempts to make some sort of statement regarding a wall, though its meaning isn’t clear. The U.S. government has been shut down for 26 days due to the debate over a wall on the southern border. The flier, however, mentions Israel, not the southern border. Images of the fliers began circulating on Twitter early Wednesday. One reader said the fliers had been left under rocks on the doorsteps of homes in the South Hills and Miller Creek. Welsh said there’s little law enforcement can do without an official complaint. In December 2016, hate-filled leaflets with Nazi propaganda began appearing at area homes, including at those of members of Har Shalom, a Jewish synagogue in Missoula. That prompted widespread community outcry and at least one public meeting involving local officials. The man behind that distribution was later caught.